Regular milk and chocolate milk contain beneficial carbohydrates and proteins needed for recovery, replenishment and adaptation after exercise. However, chocolate milk has a better combination of carbohydrate and protein and is more suitable for post exercise recovery. This makes it a better post-exercise drink. Chocolate milk contains a larger amount of carbohydrates than regular milk, which makes is a superior recovery drink. During exercise, your body relies on blood glucose and stored glucose inside the muscle as fuel. The recovery period from exercise is the time your body replenishes the glucose it used. In addition, part of adapting to exercise is increasing muscle glycogen -- stored glucose. Without enough carbohydrates available during re-fueling, your body cannot do this. In addition to replenishing and increasing glucose supplies, chocolate milk can also help to maintain muscle mass. In a study published in "Medicine and Science in Sports and Exercise" in 2010, researchers found that athletes drinking chocolate milk after exercising at near-max intensities experience a reduction in lean muscle mass breakdown. In a similar study conducted by John Ivy of the University of Texas in 2011, 32 healthy subjects cycled for one hour on five days per week, then drank one of three recovery drinks. Those drinking the chocolate milk for recovery experienced greater gains in muscle mass and a reduction in body fat. Chocolate milk also helps your body rehydrate and replace lost electrolytes. Sweating during exercise leads to a loss of both water and essential minerals. Chocolate milk contains water, making it good for re-hydrating. It also contains potassium, calcium and magnesium -- the three electrolytes you should replace after exercise. To fully take advantage of the physiological changes occurring during recovery, drink chocolate milk immediately after exercise, then again two hours later. 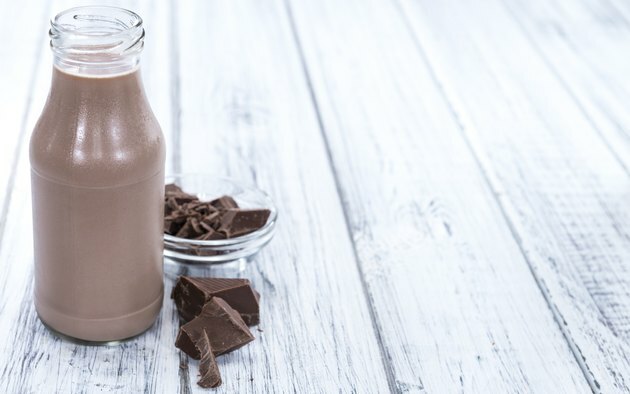 According to John Ivy, a University of Texas professor who has led several studies on chocolate milk as an exercise recovery drink, the amount of chocolate milk to drink depends on your size. However, the typical amount is between eight and 14 ounces.